Upgrade today: take the fear out of buying new hardware. 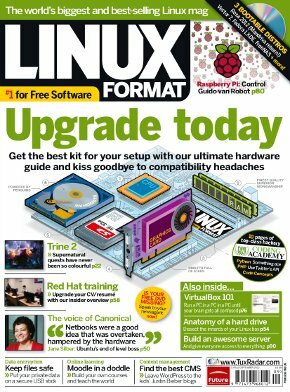 We've been benchmarking, testing and generally doing time-consuming things for this issue, sifting through piles of SSD's graphics cards and other bits and bobs to find what works best with Linux. To be honest, it's been a massive pain in the behind, which is a good thing: we've taken one for the team, so when you come to upgrade your Linux machine you'll be able to stand on our shoulders and things will Just Work. In other news, we're blown away by Trine 2 (if you have any love for wizards and knights you really should try it today), talk to Canonical's CEO Jane Silber about what direction Ubuntu's going to take now that it's no longer the world's favourite distro, and dissect a hard drive to find out what makes it tick. Our intrepid Staff Writer Jon Roberts bravely boosts his CV with a Red Hat training course and sysadmin qualification to find out whether it's worth the money (and what it can do for your job prospects), plus we've insight and techie tips on PHP, Python, FreeNAS and more.